Dr. Heidi C. Mier, D.V.M. Dr. Heidi Mier, D.V.M. has an Integrative Veterinary Medical practice in Dixboro, Michigan, her primary location, where she works independently from The Dixboro Veterinary Dental and Medical Center. In the practice of Integrative Medicine, conventional methods are combined with complementary and alternative medicine for both diagnosis and treatment. Dr. Mier's practice emphasizes Traditional Chinese Veterinary Medicine, utilizing acupuncture, herbal and food therapy for wellness and healing. 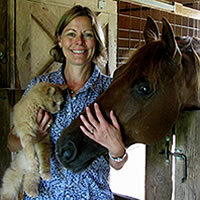 Dr. Mier earned her Doctorate of Veterinary Medicine from the University of Wisconsin-Madison and completed an Internship in Small Animal Medicine and Surgery at Cornell University. Dr. Mier was certified in Small Animal and Equine Acupuncture through the Chi Institute and has completed coursework for Chinese Herbal Certification, as well as for Food Therapy and Tui-na, or Chinese Medical Manipulation.